Why Copy When You Can Innovate? As a designer of equipment and machinery, I can say that there is nothing quicker than copying. This is true almost regardless of the situation. I have designed a new component from scratch many times. A rare few times, I lost or deleted a file. The original drawing may have taken a full day to complete with all the minor details. The replacement drawing can be redone in a few hours. If I have a printed copy for reference, it can be completely redrawn in less than an hour. It is the same type of difference between coming up with the design on my own versus using a sample part to measure and quickly check details. Big ideas and brainstorming are the fast part of design. Translating those concepts into a drawing and then into a part requires lots of little details. Take a simple box: The shape is easy to visualize. Now ask how tall, how wide, how deep, what tolerance for each dimension, is it hollow or solid, if it is hollow then how thick are the walls, what color, what material, how much it would cost to use that material, how would you build it, etc. A box may be simple, but when you are done working through all of the thousands of choices, you end up spending a lot of time. The saying is "the devil is in the details". Coming up with an idea is sometimes hard, but every idea - regardless of the source - requires work to make it a reality. Patents used to require a working model before they were granted. This has gone out of fashion, but an idea without implementation is only half the job. Some people who are not designers say that there is nothing new, that all ideas came from somewhere else. They are ignoring the huge importance of combining two separate ideas. The screw was nothing new. It is just the simple combination of a wedge wrapped around a cylinder, but together the wedge and cylinder are useful in ways that each idea separately is not. Combining ideas is innovation. The more surprising the combination of ideas is, the more innovative the resulting design. A saying that people can incorrectly use is "good artists copy, great artists steal". It is one thing to have the skill to copy the brush stroke of Michaelangelo. That talent would let you copy his work. It is far harder to see into the nature of his designs, to understand the technique, and then use the concepts to create new and different designs. The idea that you are "stealing" is simply sensationalizing the hard work involved. The final element to consider when you decide if you should copy is customer preference. When you are the innovator with the product or design, you are the first to capture the customer's thinking. You are implanting into the collective consciousness a model of what the product or design should be. Once created, this picture is hard to change. Coke could not introduce "new Coke" without a major backlash. It could slowly change minor details, like the switch from sugar to corn syrup as the sweetener. Microsoft could not switch from Windows XP to Vista without facing tons of criticism. They could make minor changes and make Windows 7 the success that Vista was not. If you are going to make a change from the past, you have to provide an equivalent exchange. Apple could drop the replaceable battery on its laptops by providing longer battery usage instead. People are going to resist change unless they can see the benefit. Then don't forget the marketing campaign still required to explain the benefits to the consumer. The truth is you have to copy the innovator - because that is what people want. Any changes or tweaks better have a benefit and not just be a change to be different. The challenge is then how closely can you copy without getting in trouble? If you think that a design patent on rectangles and round corners is bad, what about a patent on the colors red and yellow? McNeil, makers of Tylenol, spent millions developing their gel coated product after the "Tylenol scare". They not only patented the equipment and process (these are utility patents), they also patented the look (a design patent) of Extra Strength Tylenol gelcaps. They were spending millions on advertising and consumer preference studies for their new product. They did not want imitators taking a free ride off their hard work. When Granutec started selling a similar product with the nearly identical colors, McNeil took Granutec to court. While the manufacturing process was different, the look of the products was too similar. Granutec lost and had to make changes to its product. This lawsuit had nothing to do with the active ingredient. The issue was the look of the product, a red and yellow colored tablet, was too similar to the innovator. Granutec even admitted it wanted its product to look similar so the consumer would know that their product had the same use as the innovator. Innovative companies want no competition, and if there is any, they want a big difference between their products. Generic companies want to closely mimic the innovator as possible, because that has the smallest barrier to the market. It is easier to copy than create; even your own work is easier for you to copy than create. Once something has become popular, there is a cost to replace any element of the popular design with an alternate. This is true regardless of function. A simple color change is a barrier. The risk to getting of getting caught is a small barrier to competition, but the challengers never stop trying. You copy because it is the cheapest and fastest way to get on the market. Once you get your product accepted and people recognize the value, you can slowly make the changes to separate your product from the innovator. The barriers to consumer acceptance are high enough that the risk of losing a lawsuit is an accepted cost of business. The reason there has to be lawsuits is that no one knows how closely they can copy. Granutec did not know what shade of red and yellow would be different enough to avoid a lawsuit. There is no law that says the difference has to be a certain percentage. Without a specific law or code to follow, these decisions are left for lawyers to argue and juries to decide. A company knowingly pursuing this course of action should establish the proper paper trail. The design should start off as a direct copy. Then over the course of several months and several emails, the design is tweaked to be different, original is some small ways. This would establish that they worked hard to be different. Companies fail because they either underplay the risk versus the reward or they are too focused on getting to the market. They might fail from pride that their design is actually better. Being better does not remove the fact that the innovator has a design patent. We can only hope that they are not failing because of stupidity to see the danger a lawsuit would bring. In the end, if the damages are not too high, you win by copying. The consumer has started to like your product. You have been smart, and you have a plan to make the fewest changes possible to get around a lawsuit. A little time is lost while you prepare to switch to the changed product. Then you are back in business making money. When Apple created the gold standard of smartphone design, and they kicked BlackBerry off the throne. Every company had to begin imitating the iPhone. Google, Samsung, etc. had little choice. It was either imitate or be left behind. It may have insulted Steve Jobs that Google switched to target the iPhone. 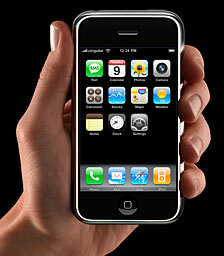 Google was showing its intelligence that the leadership role had changed and the iPhone was the new standard. As the fast growth of Android shows, switching the design focus from a BlackBerry-like smartphone with a physical keyboard to the iPhone model was the better choice. 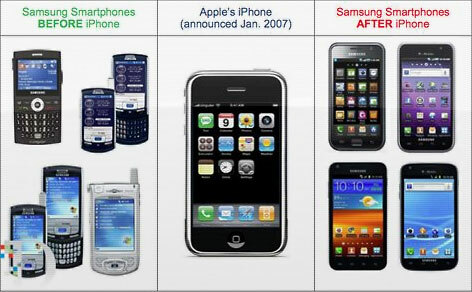 Apple's image showing how the iPhone influenced Samsung design. Samsung may have had other similar unreleased designs in the works before the iPhone came out. This does not prove they did not copy. All that matters is what kinds of phones they were releasing to market. The iPhone made them change their decision on what kind of phone the market wanted, and that decision was directly tied to the success of the iPhone. From the very day that the iPhone was introduced, Apple promised to defend its patents. During the 2007 Macworld, Steve Jobs said, "We filed for over 200 patents for all the inventions in iPhone and we intend to protect them." There can be no doubt that Apple expected to sue future challengers. Samsung was foolish for not being better prepared.